Safety tests are conducted on a wide range of chemicals and products, including drugs, vaccines, cosmetics, household cleaners, pesticides, foodstuffs, and packing materials. The safety testing of chemicals and consumer products probably accounts for only about 10% to 20% of the use of animals in laboratories, or approximately two to four million animals in the United States. Yet the use of animals in safety testing figures prominently in the animal research controversy. It raises issues such as the ethics and humaneness of deliberately poisoning animals, the propriety of harming animals for the sake of marketing a new cosmetic or household product, the applicability of animal data to humans, and the possibility of sparing millions of animals by developing alternatives to a handful of widely used procedures. The Animals in Research section is committed to promoting alternatives to the use of animals in product testing as well as in biomedical research and education. Alternatives are scientific methods that accomplish one or more of the "Three Rs": They replace the use of animals in a scientific procedure, they reduce the number of animals used in a procedure, and/or they refine a procedure so the animals experience less pain, suffering, or discomfort. The HSUS plays an integral role in encouraging manufacturers to produce and consumers to purchase household products and cosmetics that have not been tested on animals. Launched in 1996, the Coalition for Consumer Information on Cosmetics (CCIC) represents seven U.S. animal protection organizations, including The HSUS, as well as international partners from the European Union and Canada. The aim of the CCIC is to urge cosmetics and household products manufacturers to sign on to the Corporate Standard of Compassion of Animals. This is a rigorous product-labeling and manufacturing policy that ensures manufacturers (and suppliers) will not conduct or commission animal tests and will not use any ingredient or formulation that is tested on animals. Companies that sign the standard may portray the CCICs "leaping bunny" logo on all of their products as proof of their commitment to the manufacturing of "cruelty-free" products. Perhaps there are a few people out there who buy baby shampoo for themselves just because it has a cute picture on the label, or because they have about as much hair left as a baby. But most people buy it because they think its safer for their child. Many shampoos and other personal-care products undergo safety testing before theyre made available to consumers. This can include exposing animals to the compound to see whether they develop skin irritations or get sick. Animal testing for pharmaceuticals is even more perilous-animals are often intentionally given diseases to see (a) whether a new drug will have an effect on the disease, and (b) whether the drug has any serious side effects. Test animals may develop tumors or other nasty conditions, and are often killed intentionally at some point in the test so scientists can examine the animals innards for signs of damage. 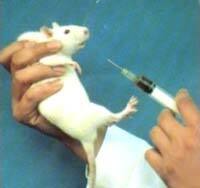 How Far should we go to eliminate animal testing? What about other types of chemicals; for instance, new drugs? Are we ready to let inter-species ethics trump our desire for new pills that can fix whatever ails us? Some of us may be, others may not be. Chemical pesticides present another side of the ethics questions regarding animal testing. When setting a safety limit for human exposure to a particular compound, federal regulations require an additional "safety factor" above the level that was shown to be hazardous to lab animals. Pesticide manufacturers have proposed testing their chemicals on human subjects to determine more precise levels of (supposedly) safe human exposure, hoping that the levels will be more generous than those dictated by the animal-based tests. Critics labeled this an outrageous idea, saying that we should never intentionally expose humans to potentially unsafe levels of toxic pesticides. Sounds right on the surface, but is it any more acceptable to do the same tests (or worse) on unsuspecting animals? You can at least argue that the human test subjects would have a choice and would be paid, whereas the animals would all arrive at the laboratory in the traditional "Igor, get me a lab rat" manner. The naysayers point out that the more desperate members of societys economic ladder could be exploited in a human testing regime. Perhaps, but theyd still have more of a choice than lab animals get. Other supporters of animal testing argue that human studies take too long to determine the effects of chemicals-which may take decades to cause problems in humans-and that animal models allow full-lifetime studies in much less time. True, but the real question is: Even if doing pesticide or other chemical testing on lab animals makes more sense than doing it on humans, is it right? Traditionally assessed using the LD50 test (which was developed back in 1927! ), where groups of animals are dosed with different amounts of a test substance in order to determine the dose which kills half of the animals. In these tests, animals are often force-fed the substance. The LD50 test sometimes uses massive doses, completely unrelated to possible exposure levels. Other tests are available which use fewer animals with lower doses, so there is no reason why the outdated and discredited LD50 test continues. Used to determine the extent to which cosmetic ingredients might penetrate the skin (which is important in determining whether they may enter the bloodstream and be carried to parts of the body causing toxic effects). There is up to a five-fold difference in skin absorption a rate between different animal species and humans. Rabbits and guinea pigs are usually used for skin irritancy testing, with product being applied to shaved - and occasionally abraded - skin areas. Redness, ulcers, rashes or swelling may occur. The species used lack the varied human repertoire of responses, partly due to a difference in the distribution of fine blood vessels. Their skin reacts to a limited degree and does not distinguish between very mild and moderate irritation. Comparative tests have shown considerable variability in irritancy response between the different species. For example, with an anti-dandruff shampoo irritancy ranged from severe in rabbits to almost non-irritant in baboons. In the Draize eye test, substances are dropped into the eyes of albino rabbits. The animals are often immobilised for this test, for example by the use of stocks. Although it has been in use for over four decades, the predictions of the Draize test do not correlate well with human experience. For example, when 281 cases of accidental splashing of household products into peoples eyes were compared with Draize rabbit eye test predictions for the same products there were differences between human and rabbit responses of up to 250-fold. The Draize test grossly exaggerates irritant effects, and accurately predicts human responses less than 50% of the time. These are skin reactions to chemicals brought on by exposure to the light. Guinea pigs, minipigs, hairless mice, rats and rabbits are generally used in tests for phototoxicity, but the skin responses often seem quantitatively and qualitatively quite different from the comparable responses in human skin. These animal tests have not been validated to international standards. The EUs Scientific Committee on Cosmetology (SCC) accepts non-animal screening for mutagenicity. However, additional short-term animal tests are still sometimes conducted in an attempt to assess the relevance of the in vitro data to the human situation - even though the standard animal tests are of limited relevance to cosmetics toxicology. Standard carcinogenicity tests are conducted with rats and mice, not because they predict human responses most reliably but because their lifespan is short, they are small, relatively cheap and easily handled. However, the value of animal carcinogenicity tests is severely limited by problems of species variation, unrealistic doses, high costs and long duration. An analysis of animal tests for 19 known human carcinogens revealed that they yielded the correct results in only 37% of cases - tossing a coin would have been more accurate! Substances which do not penetrate the skin and are unlikely to be consumed orally in significant amounts generally do not need to be tested for reproductive toxicity - according to the Scientific Committee on Cosmetology. A positive result in teratogenicity or embryotoxicity would lead to rejection of a potential cosmetic ingredient, in which case reproductive toxicity testing would not be required. These tests are expensive, labour-intensive and time-consuming and are not always reliable in predicting human effects. For example, thalidomide causes birth defects in humans at a dose of 0.5 milligrams per kilogram of body weight, and in rabbits at 30 mg/kg. Aspirin causes malformations in rats, mice, guinea pigs, cats, dogs and monkeys - yet despite many years of use by pregnant women it is not known to cause birth defects in humans. A number of companies have pursued a no-animal-testing policy for finished products for several years. Even the conservative Scientific Committee on Cosmetology (SCC) advises that in the majority of cases the safety of a product can be judged according to the results of tests on individual ingredients, taking into account likely use. Even the European Commission has admitted that there should be no need for finished products to be tested on animals. Four European countries (Germany, Switzerland, the Netherlands, and the UK) have banned it. Finished product testing on animals should be banned to take account of advanced current practice and scientific opinion. Most standard animal tests currently used were never validated. They have passed into common use through empirical experience and by allowing substantial margins for error. Yet in the case of non-animal alternatives, a very different approach is taken by the industry, the European Commission and regulators, who generally demand that such methods should be suitably validated. Thus, potentially effective non-animal alternatives may be denied official acceptance, despite the fact that the reliability and accuracy of the method to be replaced is not quantifiably known. In some cases, non-acceptance of new methods is directly due to the lack of available data about existing animal test methods. Additionally, double standards are shown by the fact that even recent proposals for new animal tests have not always been subjected to the rigorous validation demanded for in vitro methods. The European Centre for the Validation of Alternative Methods (ECVAM) , which validates alternative tests at European level, has validated tests for (inter alia) skin corrosivity and skin sensitisation. Regulatory acceptance has been granted for skin corrosivity, phototoxicity, percutaneous absorption and skin sensitisation. For photoirritancy and skin penetration, some leading scientific experts believe that in vitro methods are already better than existing animal tests. In other areas (and not forgetting the scientific criticisms of the animal tests), it is generally agreed that more work is needed to develop non-animal tests. There is a strong case for targeting research funds towards developmental research for non-animal test methods in these fields given the wider importance of such tests. The cosmetics industrys version of the state of alternatives is given on the Web Site of the European Cosmetic, Toiletry and Perfumery Association.